Not gonna lie. When we clapped eyes on this adorable rocker, we thought we were hallucinating, so gorgeous is its sparkly unicorn-ness! The delightful rocker is a collaboration between US design giant, Anthropologie, and New York artist Tamar Mogendorff. Tamar’s work has been featured in The New York Times, House and Garden magazine, architectural bible Dwell and cutting-edge French kids’ magazine Milk, to name but a few. She’s very well-known amongst the art-loving set, for her amazing and distinctive “soft sculptures”. This beautiful unicorn takes Tamar’s usual inspiration – the natural world – up a pretty and fantasy-inspired notch. It’s guaranteed to spark imaginative play and exciting adventures for its little riders. An online-only exclusive product, this unicorn sports sparkling copper hooves and horn, with extra sequin detailing on its ears and eyes. A raw-edged mane is perfect for curious little hands to hang on to, and the pretty pony sits atop a sturdy wooden base. Basically it’s ready to rock! 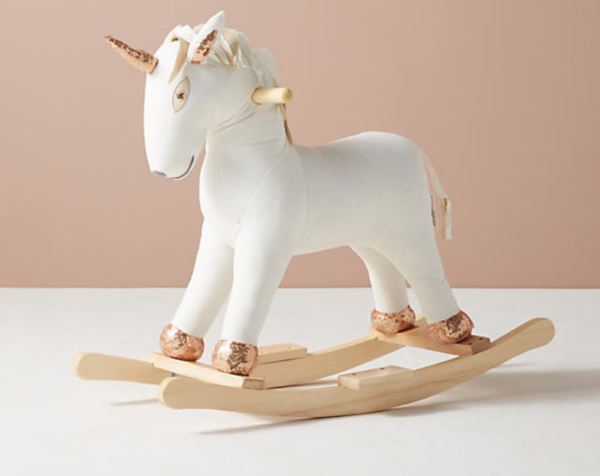 Anthropologie‘s Unicorn Rocker retails for just under $200 AUD and begins shipping in mid-December. While that’s cutting it a little too fine for Christmas delivery, it’s just perfect for the 2018 birthday delivery. You might want to call dibs and snap one up before it’s too late, lest your unicorn rock off into the unattainable distance leaving you in it’s shimmering wake! Take it down a notch? If $200 is a little out of your budget, but you quite fancy unicorn-ing your life a little, Tamar’s designed a mini version that is absolutely perfect for your family’s Christmas tree (or to hang eye-catchingly on your car’s rear view mirror!) The ornament retails at just under $30 making it an excellent, sized-down choice. 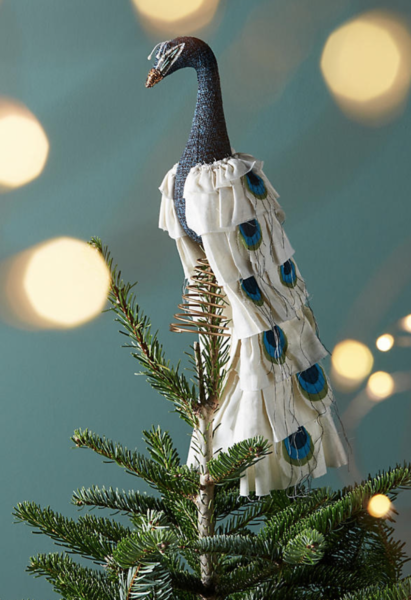 And while you’re in the festive mood, perhaps a Tamar x Anthro Peacock Tree-Topper is worth pondering? These incredible pieces are just over $100 AUD – and will next-level your Christmas tree in no time.